Google Spotlight Stories - another immersive app to inspire writing! I am a massive fan of using film to inspire writing in class. I am also fond of immersive apps where children can discover and navigate around a virtual world. Spotlight Stories combine both to give you an amazing immersive movie experience. The app has a showcase of these wonderful short films that include 3D animation alongside 360º spherical video! At the minute, there are four films available and I am excited about other films that will be added in the near future. 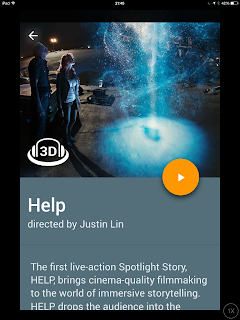 My favourite is 'Help,' a film where a meteor shower turns into an alien invasion. I can see straight away how this would inspire some amazing writing in upper KS2. What is so interesting is that each child would see something different depending on what or who they focused on when watching the film. It would encourage them to really concentrate and focus on details then rewatch the film again and see something completely new. The immersive experience would give children so much more to work with if they were to write a recount of the film or descriptive story. Other films like Windy Day and Buggy Day would be great for KS1. This will be something I will be using when we get back to school so stay tuned to see what the children produce after being inspired by this fantastic app!